We offer domestic and imported titanium bars in various grades and sizes. Our materials are Precision-engineered to ensure their safety and functionality. Sizes range from .250″ – 14.00″ in diameter and between 8′-14′ in length. We also provide custom-cut sizes for special projects and easy shipping. Please use our Weight Calculator to determine the total weight per piece of your order, based on your custom dimensions. 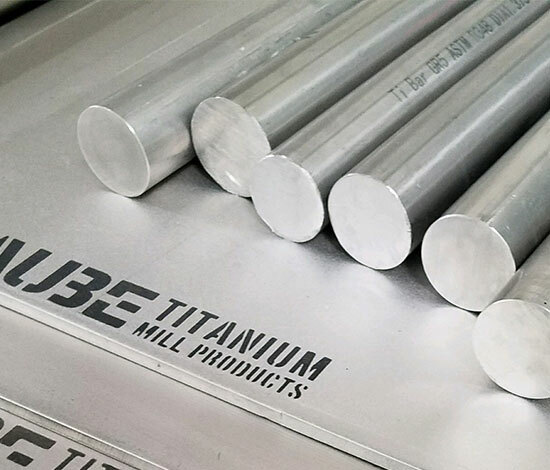 Titanium bars can be composed of pure titanium (commercially pure grades 1-4) or a mixture of pure titanium and other alloys such as aluminum or vanadium (Grade 5 or Grade 23). Titanium rods can be used for a number of different applications for several different industries. The most popular ones are used in aerospace and medical applications.